Uses: High School, Library Colors: Blue Lengths: 11 panel 20'-5" Heights: 6'-0"
From offering collaborative learning space, computers, books and research and study tips, today’s libraries are the hub of the school. 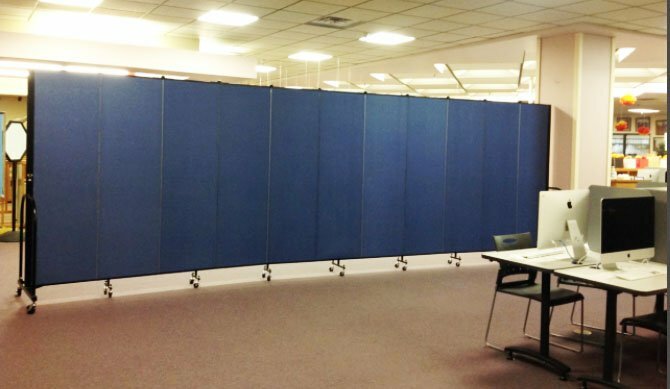 When offering that space to many groups, you must have a flexible space and Screenflex library temporary walls help with just that. According to the La Cueva High School website, one of their main goals is that “students will participate in a variety of educational opportunities in a safe and adequately maintained environment that promotes learning.” So when the school’s library needed temporary walls to create privacy for meetings, more classrooms, and tech training space, they turned to Screenflex because of our superior quality room dividers. 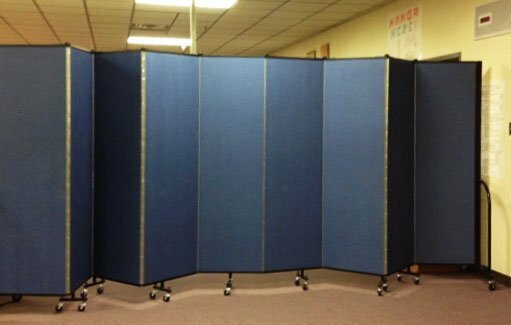 Each Screenflex temporary partitions are built to withstand high safety standards and offer a safe learning environment for students. Additionally, the fabric walls absorb ambient noise in the room. The full-length panel hinges allow the customer to put bend the divider at the hinge to adjust the length of the divider, as seen in the picture below.